The letter Eszett, also called scharfes S, is a letter that only exists in German. It has a pronunciation like that of an [s]. Up until 2008, only the uncapitalized form existed because a word never starts with ß. Due to historic reasons, this letter is not used in Switzerland. Switzerland decided to use keyboards designed for specific letters from the French language, thus eliminating the Eszett from its alphabet. In other German speaking countries the Eszett is still used normally. Some people starting to learn German write β (beta, like the Greek letter) instead of ß (Eszett), which is incorrect. In Latin 2 types of "s" existed in writing. The "s" that we know and the "long s". The "long s" was similar to a "f". 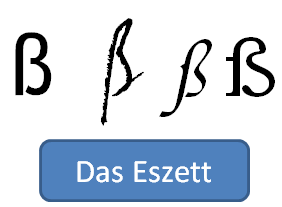 The fusion of the "long s" and the normal "s" or a "z" gave rise to the Eszett. A problem that we often have when writing texts in German is that we do not have ß on our keyboards. For this trick, you have to use the numeric keypad, which makes this combination a bit difficult on laptops in which the numeric keypad is deactivated by default.